Significant shifts in application and traffic patterns, including the increased use of cloud services, are driving the need for enterprises to reevaluate networking requirements for branch offices. This includes a desire of enterprises to use broadband connectivity to easily connect users in branch offices to cloud-based applications. As enterprises seek more flexible and cost-effective alternatives for incorporating broadband WAN services, the requirement for high performance extends from data center hosted applications to branch networks where the integration of SaaS, IaaS, and other cloud services are a key part of a digital transformation strategy. The software-defined WAN (SD-WAN) is a new solution that addresses requirements for a simpler, faster and lower cost WAN. SD-WANs allow enterprises to use multiple types of transport (MPLS, broadband, 3G or 4G) simultaneously to improve application performance and business productivity. Additionally, SD-WANs deliver the flexibility to securely connect to cloud services and also provide high availability. But, with flexibility often comes complexity. To avoid this enterprises are turning to service providers as a trusted advisor for a turnkey managed SD-WAN solution. Service providers are aggressively looking to respond to enterprise demands for greater WAN service agility and flexibility. Managed SD-WAN services represent a new opportunity for service providers to expand global market share in a $80B* market. SD-WAN services can underpin new innovative application-centric services to enable new sources of revenue and expand the on-net and off-net market footprint for service providers. Silver Peak Unity EdgeConnectSP is a complete, high-performance SD-WAN solution. It enables service providers to bring new, differentiated, managed SD-WAN services to market quickly and cost effectively to drive new revenue streams, expand market reach and deliver SLAs in and out-of-region. The Silver Peak SD-WAN solution consists of Unity EdgeConnect zero-touch physical and virtual appliances, and a multi- tenant orchestrator, Unity OrchestratorSP, to streamline service management for thousands of customers. Silver Peak optional Unity Boost WAN optimization software may be added to EdgeConnect, creating a fully integrated value-add, or higher tier service. 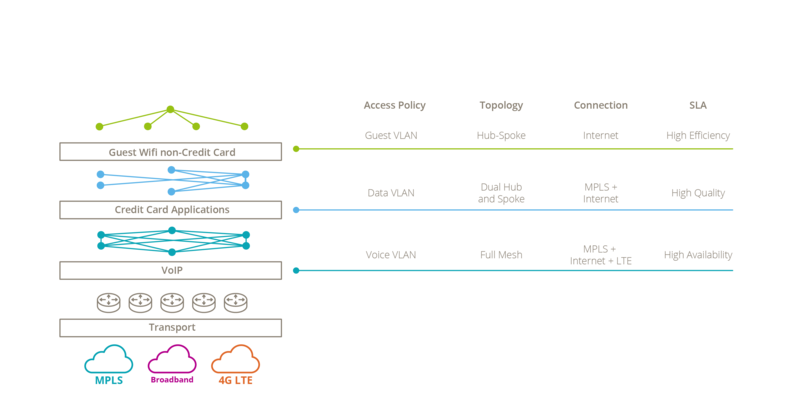 Figure 1: The Silver Peak Unity EdgeConnectSP SD-WAN solution includes physical or virtual appliances, an optional WAN optimization performance pack, Unity Boost, and the multi-tenant OrchestratorSP global management system. The EdgeConnectSP solution includes several key Silver Peak SD-WAN performance innovations that ensure highest levels of application performance and QoS over any transport that uniquely enable service providers to deliver SLAs over any combination of two or more WAN transport services. Furthermore, traffic segmentation via virtual overlays enforces security in accordance with business intent. Tunnel bonding creates multiple logical overlays from two or more diverse physical WAN connections. Each overlay can support load sharing for higher performance and higher availability. If a WAN link fails, the remaining link(s) can transport all of the important applications without interruption. In the event of an outage or brownout, the SD-WAN service automatically switches over to a secondary connection in less than a second, without application interruption. Forward Error Correction (FEC) and Packet Order Correction (POC) techniques improve performance and overcome the adverse effects of dropped and out-of-order packets that are common with broadband internet, LTE and MPLS connections. Path Conditioning provides private-line- like performance over public internet services without TCP re-transmissions. Silver Peak’s AVC identifies tens of thousands of applications, IP addresses, and web domains which can be used to direct (or block) entry to a given business overlay or port. First-packet iQ enables granular and secure local internet breakout, connecting branch and remote users directly to SaaS and IaaS instances. This unique capability maps application flows to the correct overlay or directly to the Internet to ensure the highest levels of application performance. An optional WAN optimization performance pack, Unity Boost offers additional, tiered differentiated services with a single integrated solution that incorporates service chaining. Silver Peak data compression and deduplication technologies address limited bandwidth through advanced fingerprinting algorithms to examine all incoming and outgoing WAN traffic which eliminates the transmission of redundant data. Figure 2: The Silver Peak LiveView window displays the benefits of combining tunnel bonding, Path Conditioning and business intent overlays to deliver an uninterrupted video stream shown in solid green, despite the packet loss (orange) shown in the underlying MPLS and internet links. The solution provides flexibility for service providers to map individual or groups of applications to specific business overlays that can be customized for each enterprise. With this overlay model, service providers can migrate customers to an SD-WAN at their own pace while continuing to offer tiered managed MPLS VPN and private cloud connectivity services. The EdgeConnectSP SD-WAN solution enablesservice providers to expand revenues for WAN deployments that are both on-net and off-net, and extend new SaaS cloud connectivity services for business applications from any type of WAN transport. Service providers can also define and offer tiered managed SD-WAN services that include a range of performance, latency and availability policies. For example, different service tiers might be offered based on the type of application and whether it is best effort, mission critical, high or medium priority. The Silver Peak Unity Boost optional WAN optimization software performance pack provides even more possibilities for tiered, differentiated services. As shown in Figure 3, each set of applications such as Guest Wi-Fi has its own overlay and can have a different SLA or tier of service. A mission-critical VoIP application that requires high availability SLA can be offered over any network transport as shown. Business intent overlays separate the functions of the network from the physical components of the network. Much like server virtualization converted physical servers to software instances, business intent overlays virtualize the network to increase scale, function and flexibility. Business intent overlays make it possible to create tiered, managed services for a wide variety of applications and customer policies. Service Providers that deploy the flexible and scalable EdgeConnect (SP) solution can quickly and cost-effectively bring new and differentiated, tiered managed SD-WAN services to market and deliver performance-based SLAs in- and out-of-region. Resulting in, expanded market reach and new revenue streams.